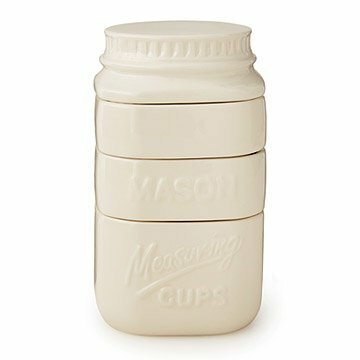 These Mason jar-inspired, stackable measuring cups make a stylish addition to your kitchen accoutrements. From fresh berries to buckwheat flour, everything feels nostalgic coming from a Mason jar. Inspired by that vintage kitchenware, this set of stackable ceramic measuring cups makes a playful addition to your kitchen accoutrements. Each of the four sections is a handy measurer for either dry or liquid ingredients (1/4 cup, 1/3 cup, 1/2 cup, and 1 cup). Between recipes, stack the durable cups for a charming countertop display. Made in China. I use this product interchangeably with regular measuring cups depending on how accurate I need to be. It's great if you only need approximate amounts. Excited to have this as a useable decoration in my cabin!